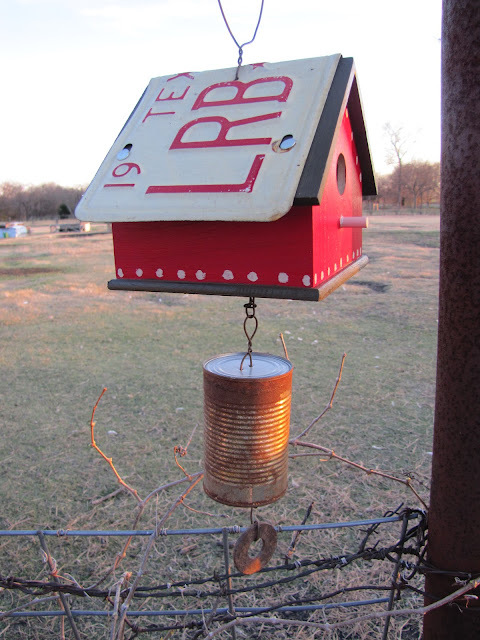 Look what Gail brought over - a birdhouse with a Texas license plate for a roof. An LRB licence plate. Thank you, Gail! Their personalities seem to have been set at birth - Vanni is a very sweet, big lug, and Tella is sharp as a tack. She figured out instantly that I only go into the pen once they are sitting on their bottoms. I didn't clicker-train that behavior, I just consistently rewarded it by going in when they are in a sit. Vanni is slower on the uptake, but he's catching on... This is mainly to keep them from darting out of the pen when I bring them their food. They are gentle and kind... a little playful, but they only get attention when they stop jumping and chewing on me. The vet put the fear of God in me about the risk of bloat with large breed dogs. We are pre-soaking the food of all the dogs now, to avoid overeating, and I try to encourage a no-roughhousing-after-a-meal rule. I'd much rather err on the cautious side, if you know what I mean. I have a friend who lost a Great Dane to bloat, and I know it's real. Vanni, doing his upside-down-Super-Dog pose. They have really settled in and are acting just like the big dogs. In fact, we looked out this morning to see Vanni laying Ruthie-style, with all four legs in the air. Those two will be quite the matched set when they get the alpaca pasture all to themselves. 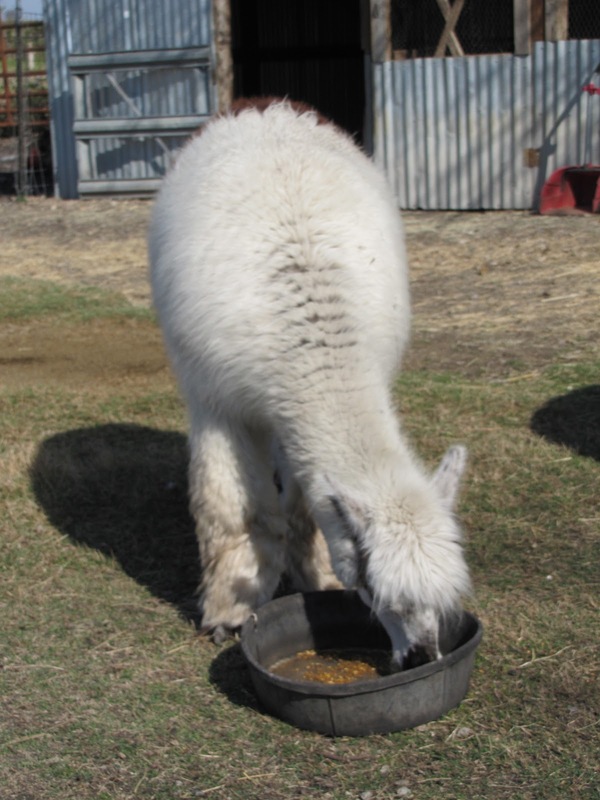 And speaking of alpacas, check out this fiber that is almost at its maximum length. These boys will be sheared weekend after next. I like to take lots of "before" pictures because the "after" pictures are so dramatic. Lots of nice Jacob wool on the hoof, too. Israel is doing a bang-up job putting on an impressive staple length. 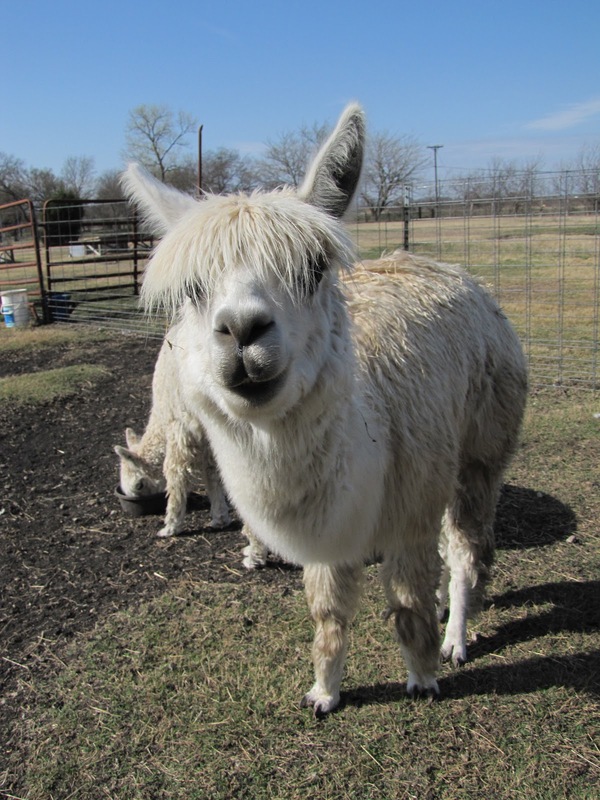 All the sheep will be sheared March 31st here at the farm, and you're invited. Jonah's fiber is not the absolute softest in the pasture, but he has density to spare... this is a very heavy fleece. Boaz's baby-soft locks have a sweet apricot cast, which absolutely glows when you part the fleece. But if you fondle the fleece too much, he insists on a treat of some kind in return. Carrots are good. If you've been considering a fiber share this year, keep in mind the cut-off date is April 15. Then there'll be a break while we get the fiber processed. Once the fiber is disbursed to the shareholders, we'll begin selling the 2012 fiber harvest shares. And the fiber cycle keeps on spinning! Wow, can't believe how the pups have grown and love the "super dog" pose. LOL! There's going to be some gorgeous fiber in that bunch for sure. Enjoyed this post, as always. Great birdhouse! The puppies are adorable and the fiber looks happy on the hoof. Way to go, Gail ! AND You, too, Cindy !! 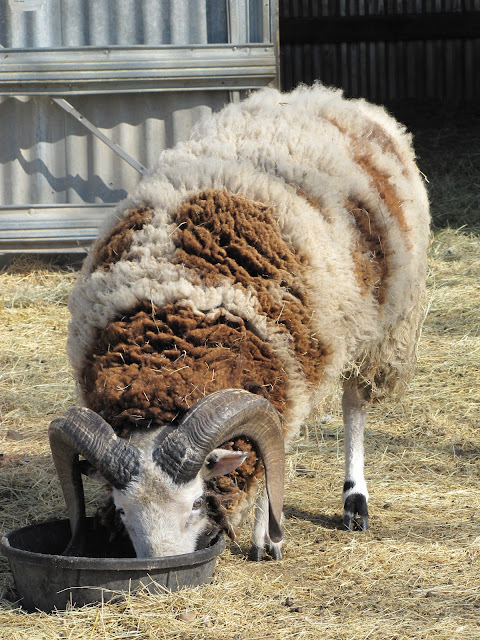 Super-great photos and "My, what gorgeous fleece you have!" May I? As a lover of quite a few big dogs myself, I'd say get a "slow-bowl" for the babes. Soaking will help, but a huge part of bloat is all the air they swallow while wolfing down their food. I have a bowl with partitions so Java can't just chow without working for it...I know there are other styles, and some people just put a big smooth rock in with the kibble that they have to move around to get at it. My neighbor just strews the food on the ground so her dog has to walk around and look for it...but hers isn't the brightest bulb in the box, and I'm pretty sure she's eaten a fair share of rocks while she was at it. I don't spin, so a fiber share isn't for me. I live in PA, and would love to find a farm near me that does yarn shares. So glad to see Tella and Vanni doing well. JLR - Virginia isn't exactly next door, but do check out Juniper Moon Farm at www.fiberfarm.com. Susie Gibbs started it all, and has the benchmark fiber CSA farm in the country (world?) She raises mohair goats and Cormo sheep and offers spinners shares and knitters' shares with yarn. We had a dog die of bloat and it isn't nice. This was 30 years ago before I had ever heard of it. NOW we do the toy in the bowl thing to slow our dog, a Y bone. IT's too funny. When our then dog had finished eating and walked away, THE CAT, smartypants, walked over to the bowl, moved the toy out and cleaned up the rest! Our dog now will eat around the Y. Then when she's finished she takes it out to the living room for "dessert". Animals are so funny. And all of yours are beautiful! Too Much Puppy - Is There Such a Thing?